Today, OneSoil, a precision farming startup, announced the launch of a new map, the OneSoil Map, which it has developed to allow everyone in the agriculture industry to explore and compare fields and crops in Europe and the United States – 44 countries in total. The key feature of the map is that it allows users to see how these fields have changed over the past three years (2016 – 2018). 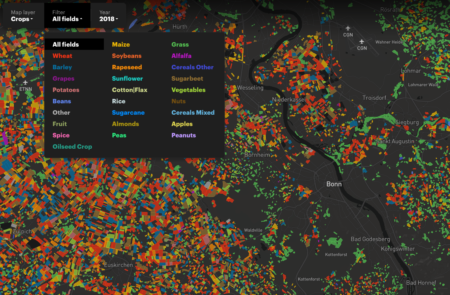 To accomplish this, OneSoil combined public data from the European Copernicus Programme and Mapbox GL JS, the latter of which helped in visualizing large volumes of ag data. The metrics included on the map are hectarage, the crop, and country crop rating. Still processing the enormity of it all. The map shows soybean around my house, where in fact we have fields of olive trees. According to the map we have 0.7 hectares of potatoes growing in the middle of town. It is Ireland, but that is taking it a bit too far!